(Bloomberg) -- The unusual surge in both U.S. stocks and bonds in the first quarter raises a difficult question for investors: Which trend is the better friend? 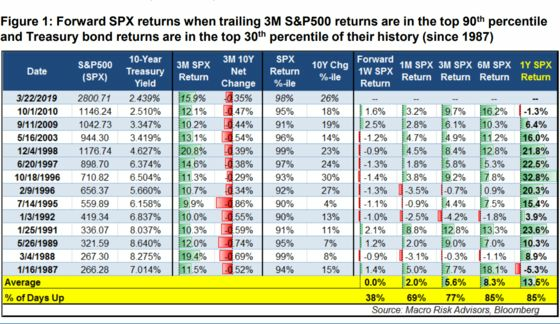 The answer is equities, according to Macro Risk Advisors. They mined more than three decades of data to come up with that result and show how “exceptional” the start of 2019 has been and what may come next. 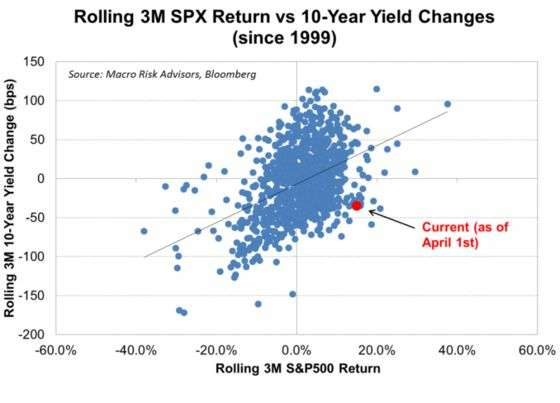 When both equities and bonds have shown similar levels of strength, the S&P 500 tends to rally 8.3 percent in the next six months and 13.5 percent over the following 12 months, with an 85 percent hit rate, derivatives strategist Vinay Viswanathan wrote in a note Tuesday, adding that the track record for bonds is more mixed. “For investors who believe that the economy will remain strong and that Fed Chairman Powell will continue to support equity prices, we think right now is a tactical time to own U.S. equities based on historical forward returns,” Viswanathan wrote. The bull market is underpinned by “solid” corporate earnings, contained inflation and an explicitly patient Federal Reserve that hasn’t shown much of an urge to extinguish the advance in risk assets, the strategist wrote. MRA recommends selling a put spread in the SPDR S&P 500 ETF Trust, or SPY, to fund the purchase of a call option that would be in the money if the S&P 500 Index cracks above 3,100 by January or buying a September call spread that also offers exposure to any U.S. equity upside.